The community at the canal end of Pier Street, shown top left – known as Pike Helve (and oddly marked of a few maps as ‘Pike Hill’) was poor, but well known. Image from Britain from Above/English Heritage. I’ve actually split it into too, as there’s so much lovely material that it’s worth breaking into separate posts. In this one, Elizabeth remember Brownhills in her post-war childhood, and mentions some very familiar names. Thanks so much to Elizabeth for a wonderful contribution – please do join in; comment here of mail me: BrownhillsBob at Googlemail dot com. Thanks! I was born in 1938 in South Yardley but moved to Broownhills before I was one and my two brothers born 1940 and 1942 in Brownhills. We also had two elder brothers 10 and 12 years older than me. We lived in the infamous Pier Street just of the High Street, My mother and father doing their very best in the terrible rented terrace house for us to keep us clean, well fed and loved. Against all the problems of no water in the house, only a tap in the yard for all living in the terrace and outside toilets. My brothers and I remember other shops . At the top of Pier street turn right there on the corner was Kingstons Shoe Shop. (He was also our Landlord) They was also Holmes the Green Grocers (in which the sisters worked) Starbucks the Butchers (son Tommy went to school at the same time as our Tom) I think Caters Electrical shop was there before they moved over the road to the bigger shop. There was also another shoe shop called Kingston One time there was a dentist, (which I had the pleasure of going to) and of course the Co-op, there used to be Smiths (who also sold homemade ice-cream) and I don’t know if it was taken over by the Co-op Butcher shop or whether it was side by side. Selwyn Smith was further down the High Street and I used to go to Junior school at the same time as Joyce Smith his daughter. (As well as Dena Webster, Betty Hampton (funny enough which is now my name). Selwyn Smith and his competitor Mr. Pelari kept generations of kids happy with their local ice cream. Image from ‘Memories of Old Brownhills’ by Clarice Mayo and Geoff Harrington. Across the road just near to Brickiln Street was my favourite Sweet Shop, run by I think Mrs. Shrigley and her husband. We would go in with our sweet coupon and she would make it stretch as best she could. An ounce of this from one jar and ounce of that from another. We had H. Brookes clothes shop which used to belong to the old Kent sisters. My Mom used to buy our clothes from there. Then there was Craddocks. I remember Joes, and of course Mrs. Daft’s fish and chip shop. I cannot remember now if it was Mrs. Daft who fell into the Canal and my brother Matt got her out. He received a certificate from the Royal Humane Society for doing this. I know he had just had his wages and there were still in his pocket when he jumped in and my Mom hung his pound notes on the line to dry. 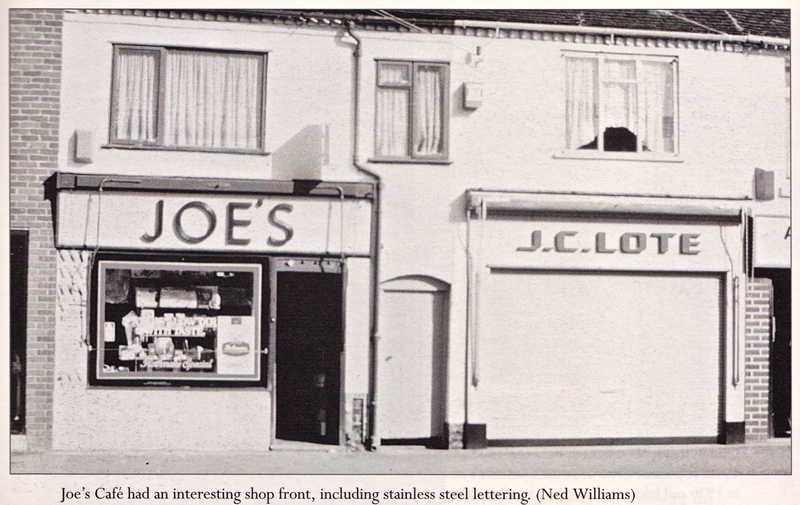 I think most of us of a certain age remember Joe’s in Brownhills High Street – not as the book says, a cafe, but a sweet shop and tobacconist. They had a fantastic range of ice cream in exotic flavours, and they sold fireworks around bonfire night. Lote’s, of course, was the rather dark jewellery shop, and just out of shot, next door, was I believe the Ash & Nephew off-license. From ‘Around Pelsall & Brownhills’ by David F. Vodden. Tomlinsons Paper Shop, where my Dad would go every Saturday to pay for his papers and have a chat and pay on his card for our Christmas presents – books , toys etc. The Regent Cinema where I spent many a happy Tuesday and Friday night downstairs could not afford to go upstairs. We use to have two films a week. Mr. Turner was always around and if we left anything like a hat or gloves he would nine times out ten have it there for you. 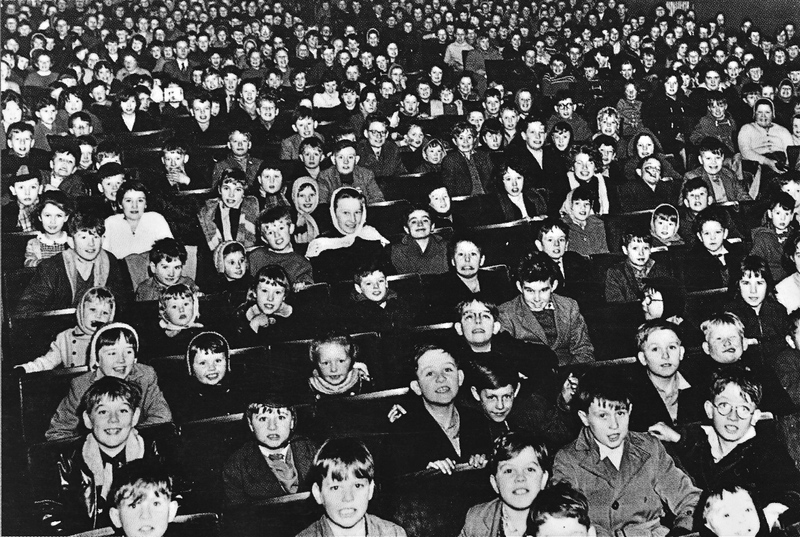 The audience at one of the last Saturday Matinee shows at the Regent Cinema, Brownhills, in 1962. Taken from ‘Around Pelsall & Brownhills in old photographs’ by David F. Vodden. I remember going to see Victor Mature in Samson and Delilah and the film broke down and he gave us all our money back or we could go another night. I also remember Princeps and Bradburys with their large windows. We also had the fair every year on the ground by Silver Street. I see in the poem he mentions hairdresser Tommy the Black, does he mean the coloured Barber who had his shop further on than the Cinema and was named Mr. Brown. I think his wife was also a ladies hair dresser. My father used to go there for his hair cut for years and when my Dad retired due to ill health this Barber would not take another penny for cutting my Dads hair. In the 60s, Brownhills was home to several Emporia, including Prrinceps and Bradbury’s. Image form ‘Memories of Brownhills Past’ by Clarice Mayo and Geoff Harrington. My two brothers and I when we meet will often go over old times (maybe to the boredom of our families) and wonder whatever happened to some people. For instance there used to be a family called Cresswell who lived in Pier Street, who really were much poorer than us, a lovely family and very intelligent, we can recall Freddie and Winnie. I remember their father dying and their poor Mother being left to brig them up. 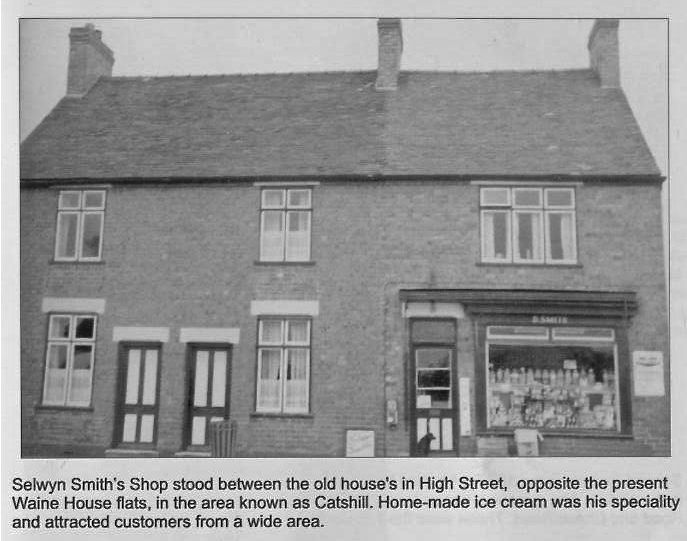 This entry was posted in Brownhills stuff, Followups, Interesting photos, Local History, Local media, News, Reader enquiries, Shared media, Shared memories and tagged Allan Bird, Barbers, Barbershop, Brownhills, Brownhills local history, Butcher, Chasmic, Elizabeth Hampton, Golden Grill, Harvey, Jeweller, Lichfield Road Chip Shop, Local History, Lote, Memories of old Brownhills by Clarice Mayo and Geoff Harrington, Neville's, New Photos, Pye, Range Records, Seeds Lane, Tandy. Bookmark the permalink. Definitely Saults chip shop and fishmongers next door to the old cinema. I lived in church road and watched as the old site was demolished and the new shopping centre was built. Unfortunately now look at it! Mr Brown the barber was my preference as my mom Beryl Margeret Cresswell (then remarried when my dad died to become a Matthews) always took me there. Mr Brown always put me at ease and as far as I recall he never accepted the full amount of money my mom sent me with even though she said it was exact change. With regards to the Cresswells in Pier street I believe they were related but due to step dad family circumstances never seem to visit them. I lived in Pier Street for my first eleven years from 1954. The Seedhouse family lived opposite and Melvyn and I spent hours playing cowboys and Indians together. I remember there was a small farm at the bottom of the road on the left ( lived in by Mrs Penn?). I also played with children from the canal cottages but I can’t remember their names. I loved the field where the clinic was built and remember hot sunny days playing in there. What a great write up and a bostin trip down memory lane. Born 1954 and always a Brownhills lad i can remember the best ever chips from Sault’s and after a custard cream eclair from Taylors cake shop. I also remember when i was young helping me grandad in his shop at the bottom of the High Street by the Warreners. I was also a regular at the Saturday matinee, can remember the first time me Dad took me to Jack Shirley’s for a hair cut, wanted a beatles style ended with short back and sides. This brings back such fabulous memories for me and my sister. We are going to walk everywhere for the next 2 days. We should reach Briwnhills by lunch time today so will stop off at The Crown on the A5 close to where we lived for a spot of lunch. Does anyone remember Foy’s grocers and off license shop on Brownhills 83 High Street ?? I lived in Pier St during world war 2 evacuated from Birmingham 1940 lived in canal cottages so poor, we swam in the canal, played on the ice when it was frozen. Ours was the first house, think there were either 10 or 12 but I remember there was a pub at the end by the canal bridge, we kids just ran wild – it was my Auntie Lil’s house, she got TB fetched her husband back from the middle east but she died. I remember the Cresswells, Bessie who had some teeth out but died in the process. I now live in Western Australia, a very old lady now, but my memories of Pier St will always be with me. Hello, Just seen your write up on Bobs Blog. I wrote the article on Pier Street. Perhaps we met years ago. I too am an old lady now. See here – fill your boots! The gasometer went long ago, in the early 60s. ’cause we didn’t have one…. I loved this article my gran lived in pier st by the pub by the canal my mom used to take me there on a Sunday afternoon i remember calling at a Joes for sweets The folks were poor but friendly. My mom is ninety now but still talks about how poor they were. Thank you Sandra for your kind comments. I bet I knew your Nan as I am eighty now.